Dire Straits were inducted into Rock And Roll Hall Of Fame in Cleveland, OH on April 14, and video from the annual ceremony is streaming online. Rolling Stone reports the absence of leader Mark Knopfler, guitarist David Knopfler and drummer Pick Withers left the band to be represented at the event by keyboardists Alan Clark and Guy Fletcher and bassist John Illsley, who inducted the group into the Rock Hall himself as no one appeared as a presenter to do so. The bassist acknowledged Knopfler’s absence, saying “I know there’s been a lot of speculation about the fact that Mark is not here, but I can assure you, it’s just a personal thing. It’s personal reasons, let’s just leave it at that. This is really more about a group of people more than one person, it’s a collective, a brotherhood and that’s something that needs acknowledging tonight." "I know it’s a little bit odd,” concluded the bassist, “but it’s my honor to welcome Dire Straits into the Rock And Roll Hall Of Fame." While Mark Knopfler has not commented publicly on the event, his brother and group co-founder David Knopfler made headlines recently when he announced his plans to not attend the induction after claiming the Rock Hall would not pay his travel expenses, as previously promised. 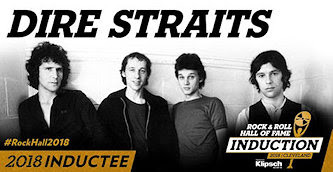 Eligible for induction since 2003, Dire Straits entered the Rock Hall on their first nomination as part of the Class Of 2018 alongside The Cars, Bon Jovi, the Moody Blues, Nina Simone, and Sister Rosetta Tharpe. The 2018 Rock And Roll Hall Of Fame induction will be broadcast by HBO on Saturday, May 5 at 8 PM EDT.